I keep a lot of different knitting needles at hand, ranging from Clover bamboo to a variety of Addi needles and on into Chia Goos and Dyak Craft. As with anything else, I have favorites. At the top of my list are my Dyak Craft needles. I was fortunate enough to get two full sets of Darn Pretties before the fire that destroyed their wood laminate supplier, Dymondwood. And more recently, I invested in a set of their Nickel Northern Lights. I like them both, but have never knit with them in a head to head comparison. 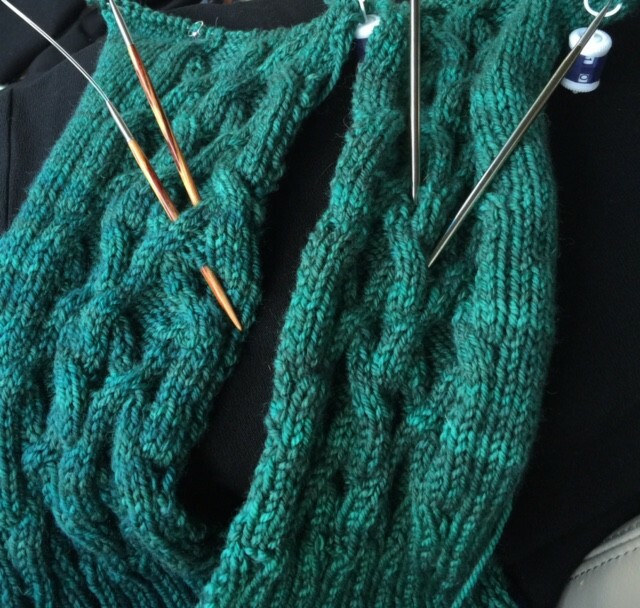 This opportunity came up last weekend when I decided to knit both the left and right front pieces of Arlo at the same time and needed two different size 6 needles. Spoiler alert: I love them both. I have nothing negative to say here. I expected the nickel needles to be a bit slicker but in reality the stitches slide off of the wood laminate with ease. The tips on both sets of needles were sharp enough to make cabling without a needle a simple and efficient process. The needles stay connected to the cables without any of the annoying slip off I’ve experienced with other needles, although I do tighten them by placing a rubber band in between my fingers and the needles. And best of all the joins are smooth and there are no rough surfaces that snag my precious yarn. My conclusion, and I have no connection to the company other than being a satisfied customer, is that these needles are well worth the price and the wait. Since the waitlist can be lengthy, you may as well go ahead and get on it now! This just weird and a little spooky. I have received my Dyakcraft Nickel NL just a couple of days ago. Just in time to start the fronts on my son’s Arlo. I absolutely loved them – the slightly sharper and longer taper handled the cables fantastically (in most cases I do not use a cable needle). I am close to finishing the second sleeve. That is a little bit spooky (and just in time for Halloween)! It sounds like were on the same knitting wave length! I tested the nickel northern lights and loved them. The only significant difference I have found is that when it gets VERY humid in the summer the next nickels work a little better for me because the wood gets a little grabby. I liked the join to the cable much better than all the other brands I had.